While largely accepted as the unofficial kick off to summer, Memorial Day has a much greater significance for our country and those who have served in the U.S. Military. Since the mid-1860s, Americans have gathered in late May to honor those who have given their lives in service to their country. Although Memorial Day did not become an official federal holiday until 1971, its origins can be traced all the way back to the Civil War. On May 30, 1868, Union General John A. Logan called for a national day of remembrance. Originally known as Decoration Day,the holiday honored fallen soldiers by decorating their graves with flowers, wreaths and flags. For more than 50 years, Decoration Day was held on May 30 and commemorated only those who were killed in the Civil War. It wasn’t until World War I thatthe holiday was expanded to honor fallen military personnel in all wars, and the holiday became more widely accepted in the south. It was still several more years before Memorial Day was declared a federal holiday, when Congress signed the Uniform Monday Holiday Act in 1968. The Act, which took effect in 1971, officially established Memorial Day as the last Monday in May. While many towns claim to be the birthplace of Memorial Day, only one has received official recognition by the U.S. government. Waterloo, New York was designated “The Birthplace of Memorial Day” in 1966 by Governor Nelson Rockefeller. Later that same year, U.S. President Lyndon B. Johnson signed legislation declaring the tiny village in the Finger Lakes region of New York as the official birthplace of the holiday. President Johnson also signed a presidential proclamation stating that Waterloo had first celebrated the holiday on May 5, 1866 with a community-wide event. Two years before General Logan called for a national day of remembrance, the businesses of Waterloo closed and residents marched to the cemeteries to decorate the graves of soldiers with flowers and flags. 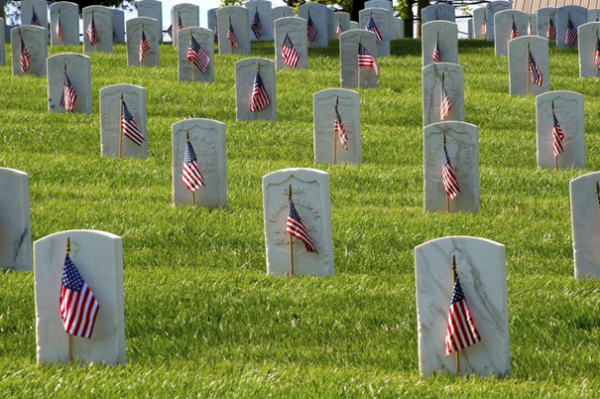 While the three-day weekend at the end of May is largely overrun with pool parties and backyard barbecues, Memorial Day remains a day of remembrance for our fallen soldiers. In fact, legislation passed in 2000 encourages all Americans to pause for a National Moment of Remembrance at 3 p.m. Many cities across the country also host Memorial Day parades, the largest of which is held in Washington DC. Each year, marching bands, active duty and retired military units, youth groups, veterans and floats make their way down Constitution Avenue for a crowd of more than 250,000 at the National Memorial Day Parade. Most national cemeteries place flags on the graves of each member of the military. It’s a massive undertaking and involves hundreds of volunteers, many from The American Legion, Veterans of Foreign Wars and other fraternal organizations, including Elks, Moose, Rotary and Patriot Guard Riders. Its a great opportunity to donate time and give back as a means to honor those that gave their lives for our country. Another 5,000 people attend the Memorial Day celebration at Arlington National Cemetery. During the ceremony, a small American flag is placed on each grave, and the President or Vice President lays a wreath at the Tomb of the Unknown Soldier. Of course, there’s no greater symbol of Memorial Day than the American flag. Throughout the United States, family and friends of veterans continue the early tradition of decorating headstones with flags, flowers and wreaths. It is also customary for all American flags to be flown at half-staff until 12 p.m. on Memorial Day. Another way to show your respect during a time of mourning is to hang black mourning ribbons alongside your flag. At Gettyburg Flag Works, we carry mourning ribbons made of 100% nylon. 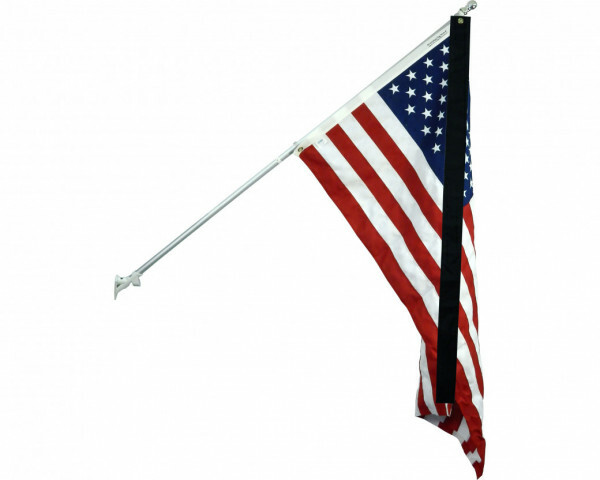 Featuring a brass grommet, it attaches easily to a variety of flags and flagpoles – including American flags and residential wall or post mount flagpoles. To learn more about the American flag, check out our Flag Etiquette and Half Staff Information. 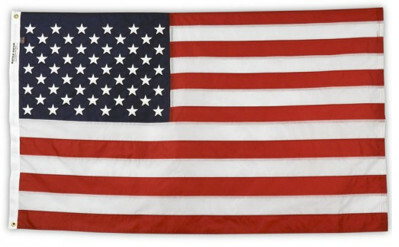 Need a flag for your Memorial Day celebration? Shop our assortment of American Flags and Hardware. Have questions? Looking to make a custom Memorial Day flag? Give us call at 1-888-697-3524 or send us a message online and we’ll get back to you shortly.